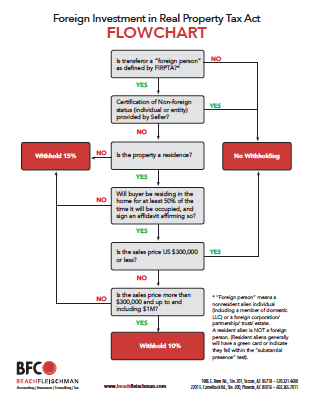 The sale, exchange or transfer of United States Real Property by foreigners may be subject to special withholding. The amount of withholding required is typically 15% of the sales price. The IRS has strict time requirements for reporting the transaction and remitting the taxes withheld. BeachFleischman, PC has extensive knowledge in navigating the requirements FIRPTA. The international tax team has helped foreign investors with countless transactions subject to FIRPTA for sales of real estate both in Arizona and nationally. Is Your Real Estate Transaction Subject to FIRPTA? The buyer/transferee of a US Real Property interest is the party responsible for meeting the withholding requirements when the seller/transferor is a foreign person. It is important for the buyer to determine whether the transferor to the transaction is foreign in order to meet the withholding requirements in the prescribed time. If the transferor is a foreign person then the transferee must withholding 15% of the sales price or amount realized in the transaction regardless of the actual gain/loss to the Transferor. Many times a transferor may not have a taxable gain when disposing of US Real Property or the actual tax due from the disposal may be less than the amount that is required to be withheld. This can cause cash flow and administrative hassles when a transferor is not able to receive a refund for the amount withheld until they file a tax return at the end of the year. Under some circumstances, withholding may be reduced or eliminated. In the case that an exemption from withholding is applicable, an application for a withholding certificate is necessary in order to qualify for the exemption. Regardless of whether withholding is needed or an exemption is applicable, adequate planning needs to take place during the transaction phase in order to ensure that all filing, application and withholding requirements are timely met. If applications for withholding certificates or reduced withholding are not filed on time or completed with all required elements, then they may be denied. In addition, proper notification from the transferor needs to be made to the transferee when there are applicable exemptions. Determining whether a transaction is subject o FIRPTA is only the beginning of what needs to be done prior to the sale of US Real Property. Once this determination is made, taxpayers need to adhere to the guidelines prescribed and may benefit from the research or alternatives to lower the withholding or eliminate the requirement completely. The benefits and costs of these alternatives needs to be weighed in advance of the transaction or time may not allow for having the minimum withholding otherwise available. Whether you are the transferee or the transferor of a US Real Property interest, navigating the requirements of FIRPTA is essential.